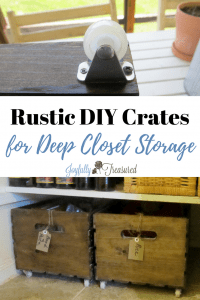 I love the idea of using wood storage crates on wheels around the home. 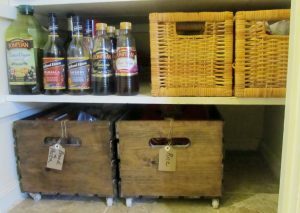 Wood crates were the perfect solution for our narrow, deep pantry. I found the idea for a pantry crate from IHeart Organizing, and decided to make some of my own! These crates work so well in the pantry because they roll right out of their little cubby and we can reach what we need. We use ours to store rice, breads, and pasta. 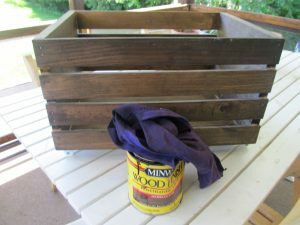 Wood Crates: I purchased four crates at JoAnn Fabric on sale with a coupon. They ended up costing about eight dollars each. These casters from Amazon. Surprisingly, the casters cost less online than at Lowe’s, and I needed four sets to do all the crates. Small screws. I used two different sizes as shown below. Luckily, we had screws on hand at home. I wiped the stain on and off with t-shirt rags. I wiped any excess off right away since the dark stain soaks into the crates easily. One quick coat was perfect. 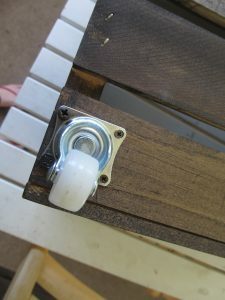 The casters were simply installed with a screw driver. 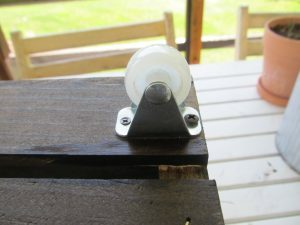 I screwed them in right on the edge of the crate bottom, so the screws could have something to sink into. I use two different size screws. Teeny tiny screws went in where there was just a slat to screw into. If I used bigger screws, the tip would poke through the bottom. I used longer screws to get more bite on the edge. This way, the crate could withstand more heavy use. I did this project a year ago now, and the storage crates on wheels are still holding up beautifully. One of the crates regularly rolls two 25 pound bags of rice that we scoop from, so I know​ they can handle abuse! The Jacobean stain gives them an aged look I love. The best part is this project is very quick and easy. It took maybe half an hour to apply the stain to all four crates, and fifteen minutes to install the castors. I made them one morning before my little guy woke up. They are a pretty addition to the pantry, and incredibly functional in a difficult to reach space. The linen closet may get one of these next! I think it would be lovely if they were painted over in white and distressed to show the jacobean stain underneath. I was so excited to use them right away that staining was as far as I went! How are you using crates in your home? Check out the full pantry reveal here!